- I downloaded Freemake Video Converter with the hope that it can possibly deal with my videos totally free. But to my disappointment, it asked me to donate if I need to activate the Subtitles Pack function. How can I get a Freemake Subtitles Pack serial key without paying? What is Freemake Subtitles Pack? 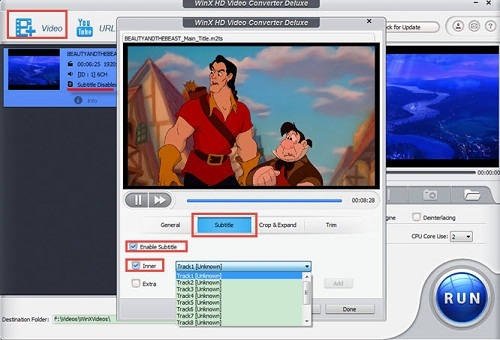 Freemake Subtitles Pack is a set of advanced features enabling video subtitles goes with Freemake Video Converter, a free and easy-to-use video editing app helping convert video formats, ripping video DVDs, creating create photo slideshows and music visualizations. Subtitle (captioning) might matters little for some people, but it means a lot to the other. Only with Subtitle Pack can users have access to editing subtitle size, altering subtitle font, watching foreign movies with special symbols, Unicode and UTF subtitles and enjoying movies with subtitles on any device. What is Freemake Subtitles Pack Key? But not truly as indicated by the name, Freemake requires a donation (i.e. 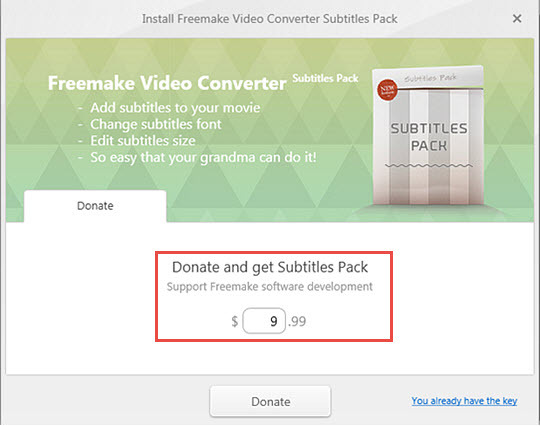 payment) in order to install the Subtitles Pack, and the default fee is $9.99. If the entered fee is less than $4.99, it will display "Your donation won't cover the transaction fee, please increase the sum". Only after paying, user will be sent an automatic email with an activation key for Freemake Subtitles Pack to the email address they provided in the payment data. How to Activate Freemake Subtitles Pack without a Key? 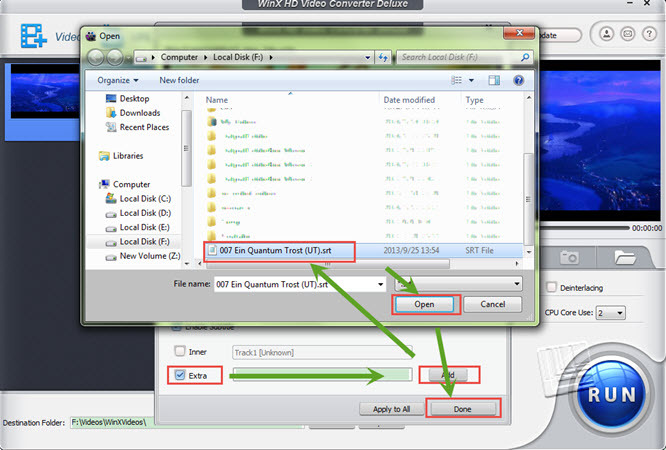 Is it possible to get Freemake Subtitles Pack key free or activate the subtitles pack of Freemake Video Converter without a key? The answer, directly, is no. However, there are always ways to find and get keys to active some other video converter with powerful subtitle features! 1. The URL of your website/blog/forum, or FB/Twitter page/YouTube. 2. The number of copies you want to get. 3. The start time and end time of your giveaway. How to Select, Add and Edit Subtitles? First of all, you need to download the Advanced Edition of Freemake Video Converter on your computer, install and open it. Or, you can directly click Subtitle column on the top left to choose or add the subtitle track you need. The Freemake alternative not only enables users to add and select subtitle tracks, but also converts any HD (including MKV, M2TS, AVCHD) videos to any popular video and audio formats, as well as to iPhone, iPad, Android tablets, smartphones, game console, Apple TV, etc. It can also download YouTube online videos, make photo slideshows and edit videos. WinX HD Video Converter Deluxe – Add downloaded subtitles to movies; disable inner/extra subtitles; convert movie videos to MP4, H264, H265, AVI, WMV, MOV, MKV, iPhone, iPad, Samsung Galaxy Note 4, Sony PS3/4, Microsoft Surface Pro, Xbox, WP8, etc; free download movies songs; make phone slideshow videos, edit movie videos.